TransPak transit cases are 100% custom-made to ensure your precision products and equipment are cushioned and secure for both storage and shipping -- again and again. Custom interiors and shock absorption systems provide maximum cushioning. TransPak's custom foam inserts enable your materials -- of any type, size, weight or dimension -- to withstand the rigors of travel including typical impacts and height drops. Rugged exteriors are efficiently designed for easy moving, storage and identification. TransPak's custom-made transit and carrying cases come in a variety of colors and can be labeled with handling instructions, your logo or any image. 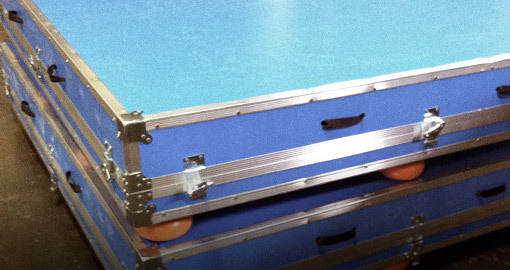 Custom-made for a variety of applications, TransPak carrying and transit cases provide protection even for the diverse needs of global medical, semiconductor, green and high-tech industries, among others. Our custom-made transit cases can handle hundreds of turns. Compare that to the costs of a wooden crate that can be reused 1-10 times, and the cost savings add up. Give us a call to learn more about our custom-made transit case capabilities. We're here for you.